My Grandparents have owned a caravan in Suffolk since the early seventies. I have been coming up here ever since I was a baby, so it makes sense we should review a Sunday roast on our Easter holiday to Suffolk. After much looking around online, I decided we should try The White Lion in Aldeburgh. The lunch prices seemed reasonable and it was in a popular location (Aldeburgh is often regarded to be “Islington-On-Sea”). I organised lunch for the two of us on Easter Sunday – I booked through Open Table, the facility on The White Lion’s website. Upon walking through the doors, we were met at the reception desk of the hotel and directed to the bar and brassiere area for our reservation. The White Lion Hotel seemed to be very family orientated – they had some face painting for children. There was another reception desk at the entrance of the brassiere, they checked for our reservation then showed us to our table. Our table was right in front of the window, overlooking the road and the classic car convention on the green just before the beach – we couldn’t have got a better table in my opinion! The venue decor was fresh and clean, with a beach theme running throughout (some nice photo prints in frames hanging on the wall of shells etc). There was a fireplace with a wood-burning stove (not on – it was quite a nice day outside). The napkins were high quality, thick coloured paper – each setting having a different colour. There was also someone playing a keyboard in the room, giving nice back ground music (and adding to the ambience). As we sat down, we were also handed a menu each – a set menu for Easter Sunday, two courses being £15.45, three courses for £18.95. We decided to have a starter and a main course, with perhaps(!) a dessert to follow. A good amount of options available, Claire decided on the smoked salmon with granary bread for starter and the roast beef for mains; I asked for the pork terrine with bruchetta for starter and roast lamb for second course. Drinks-wise, Claire asked for a glass of Merlot, I had a bottle of sparkling mineral water. The drinks were brought over shortly, the ice was presented in a martini glass with us being able to serve ourselves. I like hotels and restaurants that add these small touches – they do not cost very much to do, just some thought and consideration but it really does add to the whole experience. We were then brought some bread to share, with a large bowl that we were told was to be used with the bottles of oil and balsamic vinegar already present on the table (all of them had these). I am still quite uncouth, so requested butter which was duly brought over. Four slices of bread in total, two granary, two white – whilst they were both very nice, I much preferred the white bread, with the slightly burnt crust giving it a good flavour. Our starters were brought out very quickly. Claire’s smoked salmon looked good, with salad dressing and also a lemon (it was missing the granary bread, she used a slice from the sharing basket). 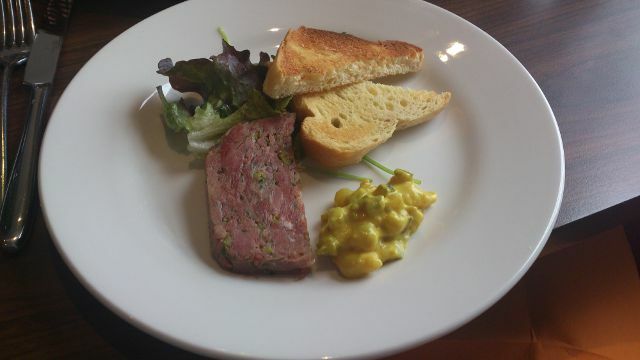 My pork terrine also looked good, with a salad, two slices of bruchetta and piccalilli. Tucking in, the terrine was very meaty. I am not a lover of piccalilli nor salad, so unfortunately cannot comment on these (I much rather choose a dessert than a starter, but Claire prefers starters so sometimes I have to compromise!). 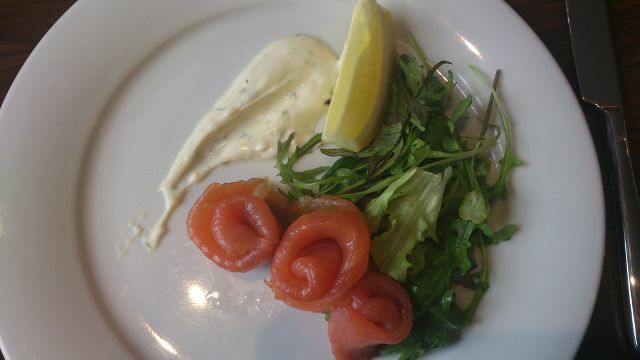 Claire enjoyed her smoked salmon and felt it was almost the size of a standard lunch for her – how was she going to finish her main course?! 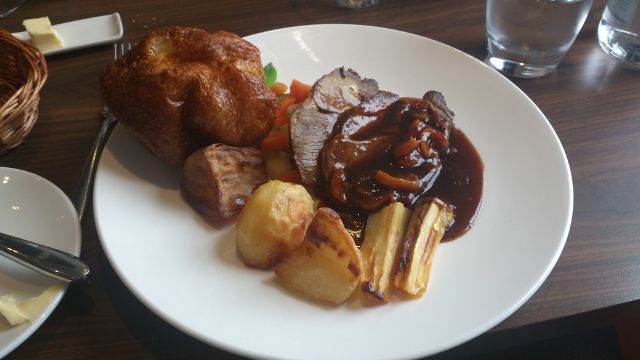 Our Sunday roasts were then served. First impressions – a good amount of meat for each plate, Claire’s roast beef seemed to be larger slices (not jealous, I promise) than my serving. My lamb had apricot onion mint gravy, which covered the meat (not the rest of the plate though). We each had three fair-sized roast potatoes, as well as a home-made yorkshire pudding, roasted parsnips and vegetables. After our main course, I just had to have a look at the dessert menu. Claire was too full from her roast beef to even look at the menu. A good amount of options were available, including bread and butter pudding, creme brulee and chocolate pannacotta. 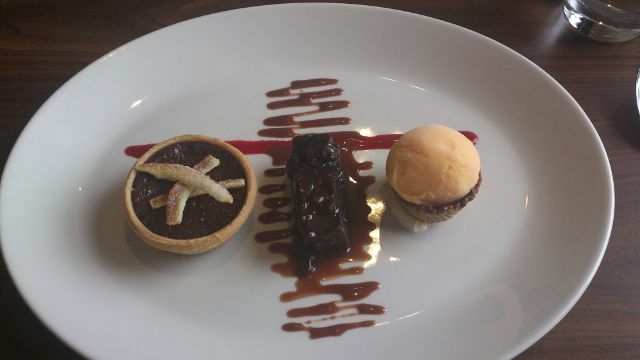 They also had a trio dessert, with chocolate tart, chocolate fudge brownie and orange sorbet – this was my kind of dessert and dutifully ordered, along with a decaf coffee for Claire and an espresso for me. Lastly, our coffee came out once I had finished the dessert. Claire made a comment: “you can tell the quality of a restaurant by how they serve the milk for coffee”. The milk was on “the side”, frothed and warmed-up. Both coffees were good, although I was a bit taken aback with the espresso costing only £0.10 less than the full cup (£2.20 against £2.30). I would have thought there would have been more of a price difference. So, onto my conclusion. The White Lion in Aldeburgh surpassed all expectations. The service was very good, always making sure we had everything we needed. The main course was heavily focused towards the meat, ideal for me. The flavours across the dishes worked (although, I did avoid the piccalilli). There was a buzzing atmosphere, with the keyboard player setting the ambience and the face painting showing they are very happy with families. It was the little touches than made it for me though – frothed milk, nice quality napkins, a good brand handwash / moisturiser in the gents toilet. It was also in a great location, just off the beach in Aldeburgh. 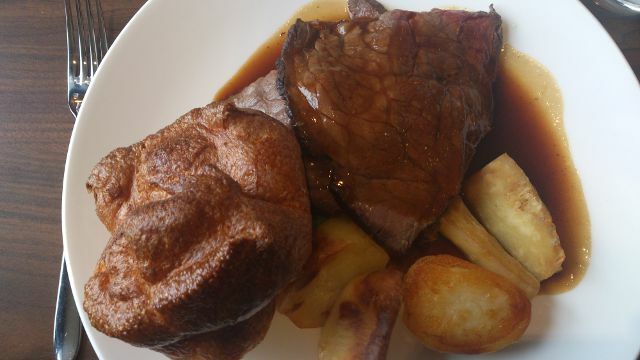 Overall, The White Lion in Aldeburgh offers a top rated Sunday lunch and one I can whole-heartedly recommend.